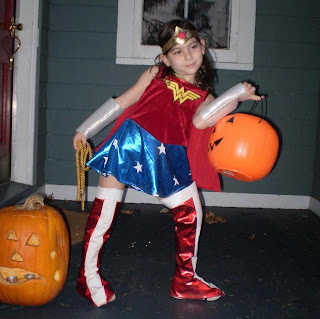 This was the first year Genevieve was able to carve her own pumpkin. She picked it out at the farm, drew on the face and did most of the scooping and carving herself. I think it came out great! She dubbed it Frankenpumpkin. We had the most perfect weather possible for Halloween this year. It was warm enough to go without coats, which always ruin everyone's costumes. This was truly amazing since it had snowed all day just two days before. In the morning I went to Genevieve's school for a Halloween party where they decorated pumpkin-shaped cookies and made lots of spooky arts & crafts. I didn't see the costume parade because I had to go to work, but it was a lot of fun to see the kids in school. Apparently they walked next door to the nursing home and visited the old folks there. Must have been nice for them, too. 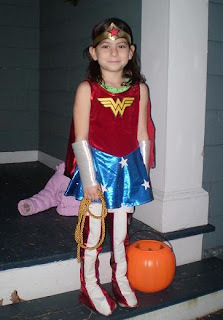 Here is Wonder Woman getting ready for Trick-or-Treating (coat tossed aside). Note that this is the child-appropriate 40's version of the costume, not the over-sexed 70's version. We went with friends in a nearby neighborhood. This year they really got it. The girls were running from one house to the next, and really enjoyed themselves. The younger siblings could not keep up, and one by one they gave up and went home. We kept losing the other parents, too, as they stopped to talk with friends. Genevieve had no patience for that! When we got home and sorted the candy, I was amazed to see that it was all good stuff that Genevieve liked. All I was able to snitch was a packet of peanut M&Ms. That's what happens when you go to the good neighborhoods, I guess. It was really nice to have Halloween on a Friday night, and to have John able to join us for the whole time. Overall I give the day an A+.